After a few fairly generous teases, Flat Bonnie has revealed a pair of new DesignerCon exclusive collaborations with Touma — Flat Knuckle Bear & Flat Mao Cat. Recasts as a 2.5d plush, this fun version of Knuckle Bear--Touma’s signature character—casts a shadow at 11” tall, is crafted in gray vinyl pleather and features sewn-in numbered DesignerCon tag. What he might lack in ferocity, Knuckle Bear more than compensates with charm and good looks. The 4” flat plush version features pink vinyl pleather and a fancy sewn-in numbered DCon tag. 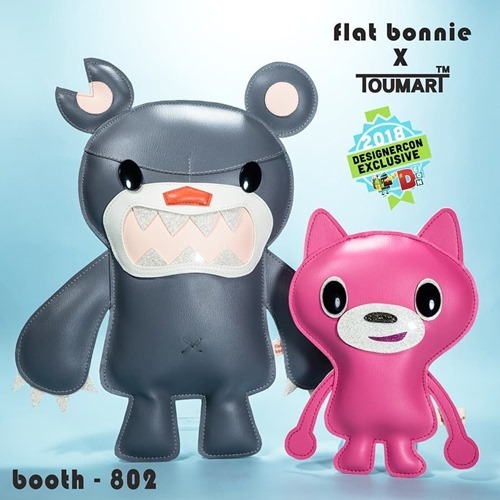 Flat Knuckle Bear ($60) and Flat Mao Cat will be available from the Flat Bonnie booth [#802]. If you can’t make it out to Anaheim, you can also pre-order the Touma collaborations on the Flat Bonnie site through 11.19, with orders shipping on 12,17.